What are web hosting resellers looking for? We often hear they want a reliable, fast and easy to manage solution. Whether it is for 25, 200 or 2000 clients, a reseller has to make sure he provides safe and reliable hosting. VPS hosting (for “Virtual Private Server”) is a perfect answer to those needs. Why? A VPS is just like a dedicated server. You have a dedicated IP address and a server just for you (even though it is virtual, it is at least as powerful). A VPS has one main benefit: it allows you to upgrade your web hosting resources in a few seconds and a few clicks. Whether it’s the RAM memory or disk space, you can change them on demand! It is a gain of time, sure, but it mainly offers you flexibility in your everyday work. You have more and more clients to host? Upgrade the RAM memory with no delay! Disk space is getting low? Double it instantaneously! In other words, you won’t ever have to transfer your clients from one server to another, even if clients flock to you. No more transfers mean no more downtime. In the end, your reputation grows and a better reputation equals more client. Yay! Everybody wins! This is what “worry-free” looks like. In addition to be powerful, fast and reliable for your clients, Funio’s VPS is fully-managed. Therefore, you don’t need to worry about security updates and server maintenance. Leave this to us! You can take your time to focus on what matters: your growth and finding new clients. With a fully-managed Funio VPS, you also get VIP customer service. This will allow you to be responsive and provide impeccable service for your clients, and therefore strengthen their satisfaction and your reputation. 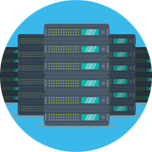 In the end, a VPS provides the speed, security and reliability of a dedicated server, but remains easy to manage. It allows you to deliver an amazing service to your clients and will grow with you.